FreeForm Optics is an optics app to dynamically create complex lenses and test how refraction happens. It can make bezier based concave & convex lenses and freeform lenses by painting them. This page gives quick help for the app. Before help below are some notes and other important information. As the app name says it allows free forms of lenses. Just paint lenses like an artist. Supports standard lenses i.e. 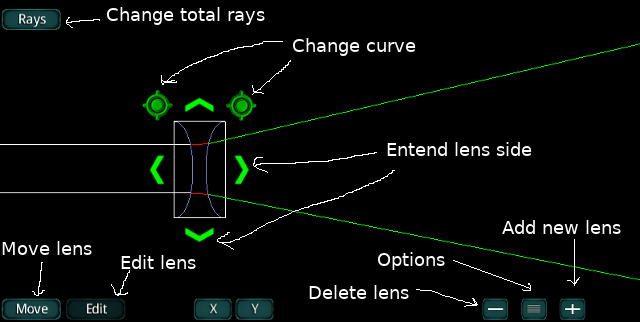 concave & convex lenses with editing option. 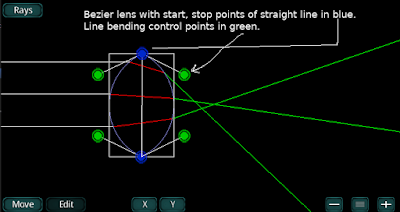 Non freeform lenses are created using bezier curves. Freeform lenses don't have a fixed focus since surface cannot be easily described mathematically. Please don't expect focal length support!. In reality there is no fixed focal length of an optical object. Only highest dense focus is considered as focal length. This can easily be tested by creating a convex lens and increasing rays to 100+. This app is mostly suitable for research or innovative purposes. Can be very helpful in teaching optics. Red rays are inside medium. Green rays are result rays coming out from medium. Yellow rays are TIR (Total Internal Reflection) rays. App has some rules not knowing which can cause incorrect optics or loss of data. Rays start from left and reaches right end. No other direction is supported. Lenses when selected show rectangular bound. Bounds of lenses should NEVER overlap as it leads to bad optics. Currently nothing can be saved for reload. Always save result as image for reference. Active work loss due to app going background can happen. UNDO REDO is not available. Set total rays using Rays button. Create lens using + button. Use - button to delete lens in EDIT MODE. Double tap on a lens to enter edit mode. EDIT MODE: Use Move button to ENABLE lens movement. EDIT MODE: Use X, Y buttons to enable disable movement along respective AXIS. Disabled AXIS icon becomes faint. Example if X is locked only Y AXIS movement is allowed. 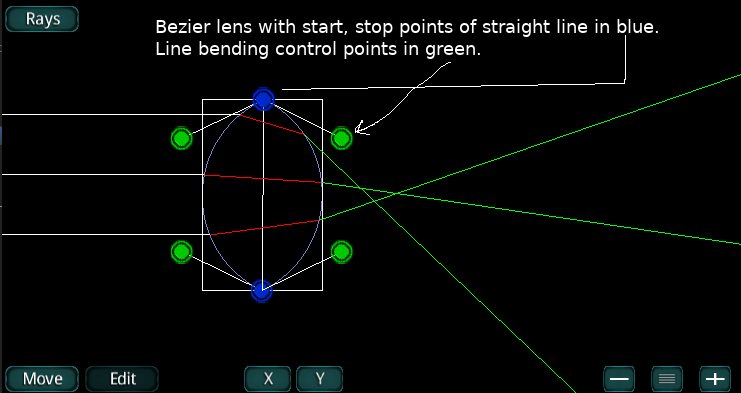 EDIT MODE: Use Edit to change shape of bezier lenses. Export image of optical setup from actions buttons on right bottom. App doesn't need much help if a user knows about bezier. Before reading further do take a look at beziers here WIKI. Double tap on any lens to enter EDIT MODE. Below illustrated images show the details of UI. Please open IMAGES in new tab or save them. They offer standalone help. This app doesn't guarantee to achieve optics of real laboratory. Focuses on making small lenses and combinations to make foundation of bigger work.